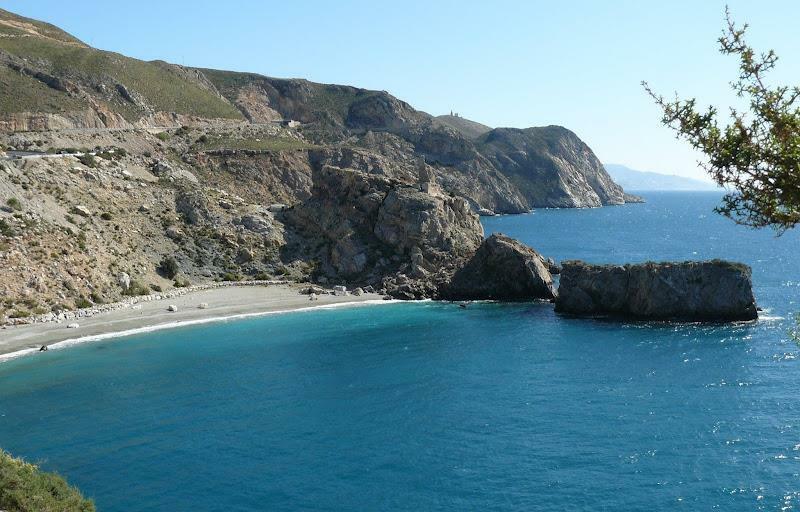 Playa de la Rijana, or Rijana beach is situated in the province of Granada, just outside of the village of Castell de Ferro, about 20kms east of Motril. The beach has consistently been voted as being one of the best on the Costa del Sol – despite being situated on the Costa Tropical. These minor technicalities apart, for beach lovers, you couldn't hope for a more beautiful spot. The dark sand and pebble beach offers exceptionally clean waters and is a favourite with snorkellers and divers alike. The beach is situated in a little cove, that you need to walk down to. Being fairly remote and easy to miss, just adds to its appeal. This part of the Costa Tropical has not opened up to foreign tourism. The area around Castell de Ferro is nestled between the clear, blue waters of the Mediterranean and the villages of the Alpujarra Almeriense. The lack of regional infrastructure has always ensured that the area remains relatively untouched. The initial high hopes for a more buoyant local economy based on tourism have given way to intensive agriculture. The area produces high-quality vegetable crops such as cucumbers, courgettes, peppers and avocados, most of which are for export to Northern Europe and/or other areas of Spain. Playa de la Rijana can get busy during the summer months, the 'crowds' being local Spaniards from the neighbouring villages and Motril. But, generally speaking, you can always find a quiet spot for yourself. Not much. It is not within walking distance of the village. There is, however, a small bar/chiringuito on the beach that offers some spectacular views, is reasonably priced and is a fantastic spot to have a drink and contemplate the natural beauty that surrounds you. The geological conditions along this stretch of coastline make it very rich in marine life. 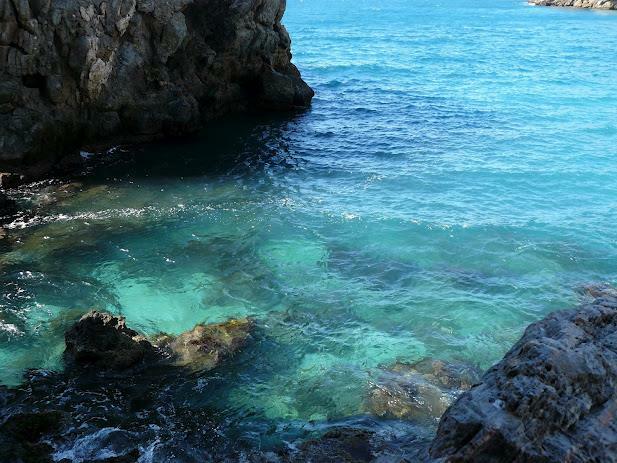 Bring a mask and snorkel – the beach and the surrounding coves are excellent for snorkelling. If coming from the Malaga/Costa del Sol direction, the beach is situated several kms before the village of Castell de Ferro. 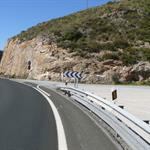 Exit for Playa Rijana - go through the village of Calahonda and keep following the old coastal N-340. The road winds up and down, goes through several tunnels and passes some spectacular coves/beaches. Playa de la Rijana is one of these. Keep your eyes peeled for the exit – see picture. 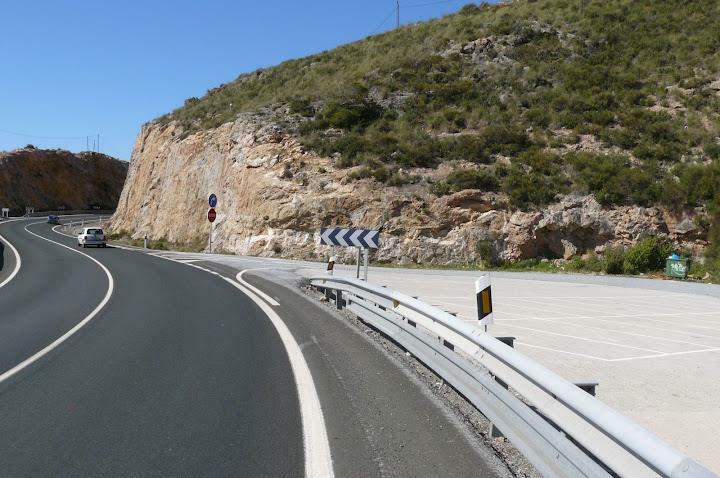 You'll see this on your left-hand side (when coming from Malaga). Be careful, people drive very quickly and the old N-340 is renowned for being dangerous. If you miss it first time round (likely) just drive into Castell and double back on yourself. Park at the top and walk down. You have to walk back under the motorway, going through a tunnel. Its not far, some 200m from the car park to the beach. Bring plenty of suntan cream, water and prepare yourself for a fantastic day out on one of the Costa Tropical’s best beaches!! The Costa Tropical is home to some fantastic beaches. One of the best and least known is Playa de la Rijana, near Castell de Ferro.